We’d love your help. Let us know what’s wrong with this preview of Blind Trust by Jody Klaire. What is your favorite passage from this book? Awesome follow-up! This second book involves:- gripping plotlines,intense action,thrill seeking moments and lots of heart-wrenching twists & turns that threaten to shatter the life of one of the main character,who seemingly perfect world was about to bust. Also very good writing,solid supporting cast that had good chemistry and dialogues. Highly recommended series! Nice follow-up. I really liked that we got to understand a few things about Renee's past and the on-going evolution of Renee and Aeron's friendship (!?). But it kind of reads like a side story, though. After what seemed like a very long wait, I was really pleased to see Aeron back again. As with The Empath there are plenty of twists and turns here to keep you guessing as well as plenty of nail biting action. The glimpses inside the killers head are genuinely chilling, a real look at a disturbed mind. I'll admit I was disappointed that we didn't get to hang out with Aeron at her mill but there were plenty of familiar faces and plenty of new friends too, so it was a short lived disappointment. B After what seemed like a very long wait, I was really pleased to see Aeron back again. As with The Empath there are plenty of twists and turns here to keep you guessing as well as plenty of nail biting action. The glimpses inside the killers head are genuinely chilling, a real look at a disturbed mind. I'll admit I was disappointed that we didn't get to hang out with Aeron at her mill but there were plenty of familiar faces and plenty of new friends too, so it was a short lived disappointment. Best of all Nan was back - this made me happy. As far as the writing was concerned, it is even more polished now without losing that wonderful voice which draws you on. The structure was sound - perhaps the plot was a shade less engaging than book one but I think that was more me than anything; I love origin stories. Versus the Empath, the Blind Trust doesn't come with the same kind of twist and turns, but given this is going to be a series of a few books, from hindsight, I like the story and pacing just as it is. The story centers around Renee - who seemed to have shot an innocent out of no apparent reasons. After the incident, Renee was basically shunning everyone out and refused to communicate what has happened. 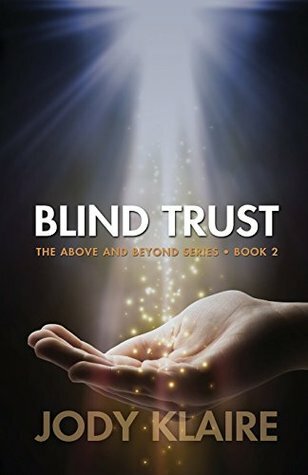 Since Aeron and Renee were stranded in a small town due to avalanche, Aeron has until the town Versus the Empath, the Blind Trust doesn't come with the same kind of twist and turns, but given this is going to be a series of a few books, from hindsight, I like the story and pacing just as it is. The story centers around Renee - who seemed to have shot an innocent out of no apparent reasons. After the incident, Renee was basically shunning everyone out and refused to communicate what has happened. Since Aeron and Renee were stranded in a small town due to avalanche, Aeron has until the town reconnects to the outside world to prove Renee's innocence. A lot of the book details the post CIG bootcamp life of Aeron, her interaction with Renee, their gradual build up of friendship and Renee's past. Reading the Empath, I absolutely adore Renee, her sensitivity and faith in Aeron. Finishing Blind Trust, I kind of have a feeling that this book established the unbreakable bond between Aeron and Renee, and Aeron's awareness of Renee's importance in her life. I'm absolutely looking forward for the 3rd book to come and hopefully soon enough. I immediately purchased this book after finishing The Empath. I needed more Aeron and Renee! And now, I'm geeking for Untrained Eye. This second book in the series was every bit as engaging and suspenseful as the first. Seeing Aeron grow and blossom and come more into her own following the release from the mental institution and friendship with Renee from the first book was truly a joy and well written character development. She's getting the hang of her burden, as we knew she would. Now let's hop I immediately purchased this book after finishing The Empath. I needed more Aeron and Renee! And now, I'm geeking for Untrained Eye. If you haven't read Jody Klaire's Above & Beyond series, I highly recommend it! OMG! It's epic! A mammoth of an arc spanning 7 books in total. Very original, unique, fantastic thrills, action-packed, funny, extremely heartbreaking and heartwarming jammed into one, romantic, truly memorable journey & adventures. First off, it's NOT what you think. The premise reads like an adventure/thriller but it's SO MUCH more than that because not only is the MC (Aeron) a very unconventional character, how she feels, thinks, behaves, is very unique because of her circumstances. Jody's skillful wordplay and story structure hook you in because you literally FEEL Aeron, her surroundings, the situations/scenarios, as well as the characters she comes into contact with, one of them in particular - which sets off a whole new plethora of emotions so hypnotic you simply MUST find out what's next! It's literally off-the-charts THRILLING! A bloody fantastic roller coaster ride! And you can't just read Book 1 ("The Empath")! You MUST, for your sanity, read the rest of them as Jody turns up the drama/humour/thrills/romance (the most unique, addictive, slow-burn you'll ever read, tbh! )/action a notch as you go through Book 2 onwards, with amazing secondary characters. Oh, I especially love the grandmother!! You'll know when you read the books! Although the series is created around Aeron, it's the 2 other primary characters, Renee & Frei, who give the story arc depth, complexity & make Aeron whole. I call them the Terrific Trio! Their affinity & special connection with each other are not unlike Harry Potter, Ron & Hermione in the Harry Potter series. They go through all the adventures, thrills, drama & angst together. All 5 (out of 7 that are released) books will make you laugh, cry, mad, angry, scream, cheer with the characters. The devastatingly slow-burn romance between Aeron & Renee...omg. Their language, their words, their actions will leave you yearning for more! Literally kills me with all the feels! (don't know how many "awwww! "'s I'd uttered whilst devouring the series!). As for Frei, you'll find out and discover her past and I can guarantee you it'll break your heart. But it'll give you a deeper level of understanding about why Frei's what/who she is. Extraordinarily heartfelt. As the story progresses throughout the books, the action gets more intense. Klaire's masterful use of words to describe the heart-pounding action sequences will literally put you on the edge of your seat! It did for me every time there was one! It's like watching it in motion on-screen! Gobsmackingly spectacular! I was holding me breath during the entire car chase scene,& then the....scene...& then the... Errr...I'd better not reveal anymore because...spoilers! You simply have to read the books to find out! I also want to add that the subject matter of the story arc that spans several books (which you'll find out) is what is happening to the world we live in today, although, unfortunately it's not being talked about and pretty much "hidden" because of the powers that be (money, power, influence) that have their hands in it. So many actually believe it's in the past & not happening anymore or just happening to certain groups of people. For Jody to use it to build her A&B world (perhaps shine a light on it, albeit it's fiction, but really makes one ponder at what's really behind the curtain of our world) is something that I'm grateful for & appreciative of. I don't think it's been told like that in fiction. All in all, the Above & Beyond series is a resounding MUST-READ!! You won't regret it! Thank YOU so much, Jody, for creating this absolutely memorable series!! I put A&B alongside HP as one of my favourite series of all time! Well done, mate! I really like this story. I like the small town folks that we meet and I really liked Zach. Aeron is a great character. I didn’t think I could love Aeron Lorelei any more than I did after reading the first in the Above and Beyond series. I was wrong. I adore that woman. In ‘Blind Trust’ I saw another side to her and a impressive depth. There is nothing she will not do for other people and when it comes to Renee her devotion knows no limits. Renee’s feelings for her are so strong too. Will Aeron ever see what is right in front of her face? When she and Renee are trapped in a small mountain town by an avalanche the I didn’t think I could love Aeron Lorelei any more than I did after reading the first in the Above and Beyond series. I was wrong. I adore that woman. In ‘Blind Trust’ I saw another side to her and a impressive depth. There is nothing she will not do for other people and when it comes to Renee her devotion knows no limits. Renee’s feelings for her are so strong too. Will Aeron ever see what is right in front of her face? When she and Renee are trapped in a small mountain town by an avalanche they are faced with problems only they can solve. But they can't let anyone know who they really are. Renee’s behaviour begins to confuse Aeron. What is behind it all? The story is exciting and full of tension and gives an insight into Renee that fascinated me. Both Aeron and Renee are developed so well and I love how Jody Klaire allows us to hear Aeron’s thoughts through the first person chapters in the book. This is fast becoming my favourite series. I can’t wait to get onto book 3! Highly recommended. Following on from the first story The Empath in the Above and Beyond Series, Aeron has been to Boot camp, and she didn’t do well. She failed the cold weather course, and wouldn’t touch a gun. Aeron and Renee are traveling to Colorado and get caught in an avalanche. They are trapped in a town and start helping the people who are trapped in the snow. Then Renee shoots a man and Aeron has to find out why, before the authorities arrive. A great follow on story, some lovely characters in it, Martha and Earl and Zack. We learn more of Renee’s past in this book, and what she went through and how it has shaped her. I love the writing style of Jody Klaire and the rich deep emotions described in this book. More than a thriller it’s a rollercoaster ride of emotions. Which leaves me wanting to read the next book Untrained Eye. Jody has been everything from a serving police officer to working in kitchens before finding her home in writing. She can often be found chuckling to herself at her own jokes; being pounced by her golden retriever Fergus; eating cake or chocolate or preferably both, and sometimes, when Fergus hasn’t run off with her keyboard, she writes stuff. Best Maid Plans is Jody’s first book independently publ Jody has been everything from a serving police officer to working in kitchens before finding her home in writing. She can often be found chuckling to herself at her own jokes; being pounced by her golden retriever Fergus; eating cake or chocolate or preferably both, and sometimes, when Fergus hasn’t run off with her keyboard, she writes stuff.